As the year comes to a close, it’s time to start your annual marketing plan for the coming year. Whether this is your first year writing an annual plan or you’re a pro, there are some key best practices that can take your marketing and clinic to new levels for next year. The goal of any annual marketing plan is to look back at last year and learn from your experiences. Then, take these learnings and develop projects and goals to support your business development. Pull your monthly reports for patient visits and doctor referrals (add other reports as helpful). Now pull the year prior (2 years ago) to do a year over year and month over month analysis. Your objective is to take a quick snapshot to see trends in visits and referrals. Also, you should identify any changes that could have contributed to these trends. For the year over year analysis, did you see more patients and get more referrals (ie. Did your business grow, stay consistent, or decline)? Both growth and consistency are favorable outcomes. Sometimes, business and market changes etc. a month of consistency can bring stability to your practice and staff. If you saw a drastic increase in appointments, what could have contributed to this growth? Did another clinic in town close, did you add a new PT, did you extend your hours? Be fair and realistic when reviewing your stats—it’s tempting to attribute all growth to “doing a good job” but there are usually quantifiable factors that influence the business. Which three months were your top performers and which were the three worst? Typically, year to year, certain months or seasons see consistent growth based on the month prior and the year prior. And certain months (usually around the winter and holidays) are slower or experience a drop in volumes. Now, look at your top three months as compared to the marketing campaigns and promotions. Did you revamp your website, increase newsletter quantities, or mail a postcard? Or did you add staff, offer a new treatment, or expand your hours? All of these factors can help determine what worked last year in terms of getting more patients to PT and what you should continue doing or implement for the coming year. Your annual marketing plan should also work to improve periods of decreased volumes. Did you experience a winter slump? Are summers slow due to vacations? Do you have a seasonal population (ie. snowbirds or college students) that impacts monthly and annual numbers? Identifying these declines and planning to offset them via your annual marketing plan is key to continuing to grow and stabilize your practice. 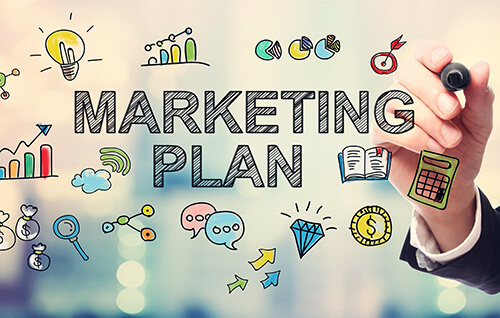 Our next blog post will dive deeper into how to choose the best marketing solution to suit your business development plans, but let’s take a high-level look at some planning methods and options. Your annual marketing plan shouldn’t be a huge PowerPoint presentation or binder full of calendars that gets stuck on a shelf from February to December. To be truly valuable and successful, your annual marketing plan needs to be organized, realistic, and responsive based on your practice’s needs. Develop a process that works for each month regardless of the season. Your marketing plan should have a monthly checklist for routine projects and then a calendar overview with special events, holidays etc. Don’t go overboard—we have all seen the monthly calendars jammed with marketing campaigns that never get executed because reality sets in. Your annual marketing plan is a plan, not a to-do list. For example, to offset the holiday slowdown, put a calendar event for “Planning Session: December marketing revamp” in September so that the end of year work is already on your radar and that you have enough time to execute new campaigns. A good ‘checks and balances’ habit for your annual marketing plan is to set a list of goals to achieve for the year ahead. The practice’s business development goals should be heavily utilized to inform this list. If you want to increase patients by 10% then develop marketing goals to achieve that figure. Maybe you want to increase newsletter mailings to an additional 500 patients, add a new social media channel, and expand your partnership with the rec soccer league. These are all strong ideas to use marketing to grow your practice and can support the 10% growth goal. The key is to be realistic and don’t attempt to accomplish all key initiatives in January. Work on these big projects one at a time and space them out for a few months or quarters. In 12 months, the clinic and its marketing program could have totally changed. Your annual marketing plan needs to be flexible in order to be truly helpful throughout the year. If your monthly data and statistics review indicates an increase or decrease in volumes that was not experienced last year, you should respond to that change and adjust your planned marketing. For example, in October, a nearby clinic closes and you start seeing a growth in patient volumes. But, your marketing plan says to increase campaigns and promotions to offset the winter slump. If you don’t revise your plan to reflect the growth trend, you could increase marketing and generate patient volumes that are not sustainable for the clinic. Instead, repurpose your November and December efforts to refreshing and reprinting your new patient packets. This change, of course, ensures that you keep marketing, but that you focus attention toward projects that are needed at the moment. … analyzing your statistics and preparing your annual marketing plan, talk with the experts. Our team has helped practices, large and small, develop sustainable campaigns and projects that complement the practice’s annual marketing plan. Check out this 8-minute video about our exclusive 4-step new patient power marketing plan for PT clinics!